It is important, moreso than previously, that the honest facts are known to the public. Most know and understand that the MSM does not report the full story. Most know and understand that the MSM refuses to report on the good deeds of Our Troops, nor their Victories. Yet those same sites that complain about those issues continue to link to them. It is counter-productive to their argument and a disservice to their readers to link to the odd story praising Our Troops in the MSM, knowing that that weight of the stories will distort the realities on the ground. This is not to say that stories should not be referenced and quoted in opposition to the false conclusions. Those sites that focus primarily on writing their opinions of current politics and policies should reference and quote those articles they are opposing. But when it comes to demonstrating the actual facts on the ground, it is very helpful to the argument to reference sites that present the full story. It is an unfortunate reality that milbloggers on occasion view other military sites as "competition" rather than colleagues and allies, that cliques exist and personal opinions lead some to undermine the efforts of some who didn't befriend the right person or organization. It is also factual that after years of bridled opinions, military Veterans are fiercely independent and strongly defend their individual right to state their own personal opinions, which means there is sometimes fierce debate between Veterans about some issues. In most cases, the debate on the issues, is conducted respectfully. In some cases, it devolves into personal animosity. Even when the Veterans are good friends, a civilian looking in might cringe at the words and arguments used. Publically, I rarely abuse my Marine Brothers, but privately, the jokes can get quite disparaging. Each Troop has a role, as does each Branch of the Military, and I have professional respect for Marines, but we enjoy teasing other Branches based on their stereotypes, strengths, and weaknesses. Most times, civilians understand neither the humor nor camraderie of the jokes. As we move forward through 2011 and into the 2012 election cycle, I would challenge Americans, Supporters of Our Troops, Veterans, and Milbloggers, to set aside personal differences, to maintain a respectful debate on issues of contention, but most importantly to source, reference, and link to sites reporting the fullest possible picture of the groundtruth. Does that mean those links must be to this site? Not at all. There are a few "competing" sites out there. I don't know of any that presents as complete a picture as ours, or "does it better," but others may have a different opinion. The point is to reference sites that are presenting the full picture rather than preferring MSM stories. The MSM will not change its ways until they feel the challenge from what Americans want. Some have said that it can be difficult to keep up with the volume of articles we put up. That is a symptom of the goal. The fact that we have so many articles is a component of our goal to provide that comprehensive evidence of the ground truth. It doesn't mean we agree with every storyline, but that it is part of the overall story that is the War In Afghanistan and the War On Terror. In the end, we are a Newsite, ran by Veterans and Supporters of Our Troops, not so much "milblog." We have many stories, because the news is many stories. But, it is also the reason we provide so many different ways to stay up on the news we offer. Following through Networked Blogs on Facebook or @WOTN on Twitter allows the reader near instant access to the headlines. Subscribing to the Newsletter (see top left sidebar) allows one to review the headlines and excerpts of the previous day in a quick and easy manner. And we spell out those means of staying up to date in Tailor the Way You Get Your War On Terror News. Personally, I think the newsletter is the best means I've found so far, as it give you a permanent record, but we understand others have different preferrences. Not every story will be interesting to every reader. Some are more interested in the battles while others more moved by stories of Troops giving out toys to Afghan or Iraqi kids. I'm a big fan of the Hall of Heroes, which tells of the stories of individual heroism and valor. And if you have a site and readers you want to keep informed, you're welcome to repost as much of the newsletter as you desire to your own page. I wrote the copyright policy, not so much to prevent plagiarism, as to encourage links. It was a response to a deluge of requests to link to a story and the confusion created in the aftermath of the MSM threatening to charge for links to their stories. I wanted to make it easier for readers to access what we see as fair use and prevent delays in what is pre-authorized use. If you do link to us, be sure to let us know. You can leave a link on the article itself or email us. We try to return the favor whenever possible. And that is not dependent on how many click the link, though it can impact whether or not we find the link to us. Evidently, some sites get upset if you leave a link about an article of the same subject, but we don't expect you to re-paste your work as comments or duplicate an article you wrote about the subject. Feel free to simply say what and how it relates to the article at hand. The spam gets deleted, but that's usually some outsourced labor in India in broken English telling us how great and insightful they found an article while trying to sell Nikes or Polish breast implants. In most cases, its pretty obvious, like "Single Mothers" alluding to their sexual desires. I've received some surprised reactions that we linked to someone's "small site." Sometimes, I'm able to frame my article sufficiently that readers visit and other times I miss the boat, but the fact is I'd rather link to 10 small sites than one "big site." Our readers probably already know about the big site, but often it means nothing to that site. It may be difficult to find the "small sites" but often their words are more from the heart and less a matter of forced expression to meet a deadline. I would hope that some of these sites become "big sites," helping to frame the future debate on issues, whether its the same focus as ours or other issues, even if I disagree. Our site has evolved since we first started. It was difficult in the early days to find information on Afghanistan and now it is more difficult to find information on Iraq. We continue to report on both, but the number of stories on each has shifted. We've increased coverage on other international events, related to National Defense, including piracy and islamism in Africa, the narco-terrorism in Mexico, the open border with Mexico, the cyberwar, and stateside terrorism. These and other subjects are found in the right sidebar on the News site. When confronted with those that would malign Our Troops with false allegations of being blood-thirsty killers, it is an easy reference to our Hardened Warrior Series to demonstrate the generosity of Our Troops. It becomes difficult for someone to claim that the false accusations of Haditha are representative of Our Troops when multiple stories of generosity in the last week outweigh all negative stories of a decade. It takes only a quick scan of the first page to find several links of the most recent schools built and medical assistance given. The combat news is presented in a daily comprehensive report titled "War In Afghanistan" and date. It is found in the Afghanistan category, surrounded by the non-combat efforts. Don't overlook our Book Reviews. 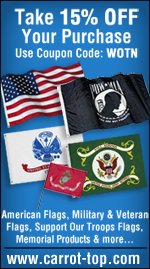 You'll find some of the best information on the bookshelves about the War On Terror and Military History. If you wish to skip straight to the original articles and conclusions we draw, you have a pair of options. We offer the category on the newsite as well as the Perspectives spinoff site. The articles are published at different times on the two sites, but by putting it up on the spinoff site, it allows us to more specifically categorize the content, as well as the page layout. It allows readers to focus on what they're most interested in, while not wading through articles they may be less interested in. Spinoff sites are created for specific reasons, generally related to the fact that a type of story deserves more attention and would otherwise be lost in the volume. The first was Overcoming Adversity. These are inspiring stories of Our Wounded Warriors. It is simply amazing what they do, after they've lost a leg or an arm. These Warriors demonstrate the "never quit" attitude that permeates the Military and they're doing more with the sacrifice made than most Americans do with full health. Most often, their efforts are designed to help others. We also offer associated sites (WOTN) to others. Whether it is a Veteran or MilSupporter who has found their voice on blogspot, elsewhere, or wants to do so, we can gin up a typepad site, dedicated to their words. I have to do the layout and such, but that's based on their desires. If they wish to venture outside the realm of WOTN policies, it needs the disclaimer of it being their opinions, not ours, because it does bear the WOTN url, but it affords them the weight of WOTN readership and can be cross-published to WOTN main in most circumstances. This offer can be effectively used when a site owner would otherwise allow their work to be deleted for lack of activity or if they just wish to upgrade to greater control without increasing costs. Such sites can be used by individual units and can be password protected. Project Honor will not be complete for a long time, but it was born of a long struggle to find the right way to honor my Fallen Brothers. I approach it with a "what would I want?" attitude. I knew the answer long ago, but I did not know the how. What I would want is to be remembered for my accomplishments and my Victories. What I've seen is profiteering and politicization of sacrifices made without regard for either. Each article I post there is but the beginning of the story. Surely, every story could be a book. The shortest covers 18 years of life while others more than 18 years of Military Service. I would gladly post the citation of every Medal earned and most stories friends and family would care to share, if, that information were available. The stories told are not "fair." They are limited to the information I can find and from there, dependent on what others are willing to share. Approaching friends and family feels dirty, and I will not push that envelope. If I send more than a single email without response, it is an oversight. I refuse to intrude more than an offer to share his story. Many are simply, not ready to talk, while others are trying to find solace and evade painful memories. If and when they become ready, I'm here. If not, I'll tell what I can through the words I can find. I will not sully their names with profit or politics. It costs me nothing but time and I won't accept donations or sell advertisements on those stories. There will be no religious undertones. That's not to say that no reference will be made to those things, but that it is not mine to decide. If their life included a love of politics or religion, it was theirs to make. If they belonged to a church or was active in a political party, it certainly bares merit in telling their story, but my politics or religious beliefs have no bearing on their story. Not every site doing things similar to Project Honor is doing it wrong or for the wrong reasons, but too many are. Those that are doing the right thing for the right reason were not on my radar when I began. But it was one doing it for the wrong reasons that got my hackles up. When I was asked to donate and found the families too were asked to donate to tell their stories, it was the incitement needed to motivate the creation of Project Honor and then I had to figure out the means. I will do it by myself, if need be, but it will take longer if that remains necessary.